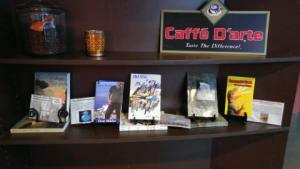 Thanks to St. James Espresso for their support of local authors! Support local!!! St. James Espresso has a duo of fantastic owners who give back to their community in many ways. Currently they are supporting multiple authors. You should check out the books and grab a cup of coffee or one of their to-die-for breakfast burritos (I’m serious, it was so good I’m giving up lunch and dinner forever). They are so much so my favorite coffee shop that I’m setting my next (after nanowrimo) novel in the Kirkland area and heavily featuring St. James in the story. Stay tuned for more info on that…. 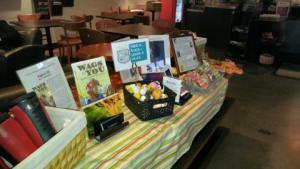 I really want you to check out the cafe and buy a book. Please, please! See our display? What a wonderful place to have near you! Tweeted. Truly we are fortunate to have Pioneer Coffee here. The owner is very giving to the community and has been a big support to us writers locally.